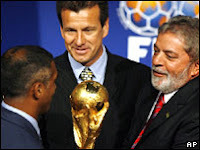 As expected, FIFA have today confirmed that Brazil will host the 2014 World Cup. Work will now start on renovating stadiums across Brazil, so that they are fit to host the world's players and media in 2014. The Brazilian government have put aside £550million in order to bring all the stadiums and facilities up to standard in time for the tournament.